During the late nineteenth and early twentieth century, the development of the Blue Shorthair was unquestioningly controversial and frought with difficulty. Unlike the blue Longhair, which developed in type along Persian lines, the blue shorthair had a mixed history of type and styles. Mrs. Carew Cox, who historically is seen as the cultivator and preserver of the Russian Blue variety was of the opinion that all of the original blue shorthairs were of foreign extraction. In the main, these were from northern Russia, but also from Scandinavia, Iceland, Malta, and a number of European climes. These blues were shown from the earliest of times, sometimes featuring in show reports dating from the late 1870's and were, at that time, nearly always referred to as Russians, or Foreign Shorthairs. However, as the English Shorthair took hold in other colours at home, (bred for its recognizable stockier conformation, with shorter legs, broader head and lower ear set), blues of this variety were ultimately produced from matings between whites and blacks, and from crosses between shorthaired and longhaired cats, as well as from original English shorthairs which carried dilute. But even in 1903, she lamented the lack of appropriate eye colour in what she perceived to be the English style of blue shorthair. We might forgive her bias a little for she was the most ardent supporter of record for the Blue longhair, for which deep orange eyes was considered more and more, a valuable prerequisite. Frances also singles out Lady Alexander (Ballochmyle), Mrs. Hughes (Sherdley). 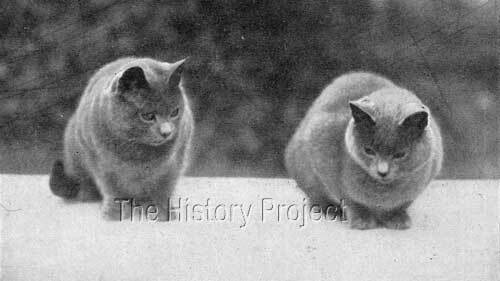 and Mrs. Carew Cox as the three principle breeders of blue shorthairs at that time. In truth, both Lady Alexander and Mrs. Hughes were breeding their blues to the English standard, while Mrs. Carew Cox was devoted to preserving the alternative or 'foreign' type blue shorthair and the one and only accepted standard, favoured the former variety or type. This undoubtedly squeezed the Russian variety, once the doyen of blue shorthairs, almost to the point of extinction, while supporting the ongoing development of an independent English or 'British' blue! Hence many of the blue short-hair cats produced during this period can be found in the pedigrees of both varieties today, as forebears of both the 'British' Blue Shorthair, and the 'Russian' Blue Shorthair. 'Michael's' dam, Sherdley Sacha II (born 18th April, 1899), is by 'Sherdley Peter' and out of 'Sherdley Sacha I'5. Both the 'Sacha's' (mother and daughter) are shown further below. 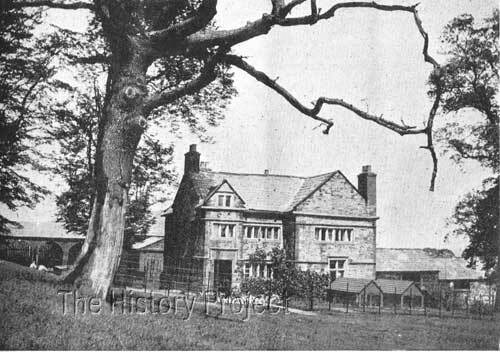 'SHERDLEY HALL FARM' , situated near St. Helens, in Lancashire. 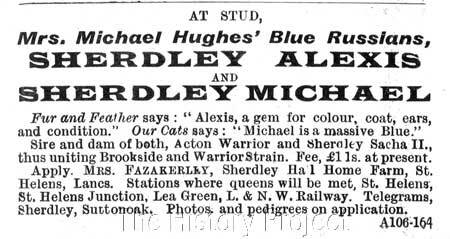 The breeder and owner of the 'Sherdley' cats was Mrs. Michael Hughes. In fact, we have very little additional information about Mrs. Hughes, other than that in Frances Simpson's review of Blue Shorthairs in The Book of The Cat, she is listed as one of the three principal breeders of Blue Shorthaired cats alongside Lady Alexander of Ballochmyle and Mrs. Carew Cox. And it would appear that apart from making the decisions about the breeding and exhibiting of her cats, the care was very much left to the control of her at attendant, Mrs. Fazakerley. "Alexis and Michael, though so young, boast a fine record in the show pen, competing in most cases with full-grown cats when they were in kittenhood. Alexis has won first in brace with Michael at the last Botanic Show, two seconds, one special, six thirds at the Botanic, Crystal Palace, Manchester, Richmond, and Glasgow. Michael's wins are first in brace at Botanic, first Manchester and two specials, two seconds and one third. Michael seemed to mature and fill out rather earlier than his brother, but this summer Alexis has caught up with him, for the latter is now the larger and more powerful cat of the two, and weighs 12-1/4 lbs. Both have quite unusually massive limbs and the broadest of heads. Michael is rather paler in colour, but perhaps loses a point to Alexis in texture of coat. The colour in all the Sherdley cats is remarkably good, and especially is this the case with the stud cats. They are a very fine pair, and in the pink of health and condition. ACTON CZAR,	Blue shorthair male, born 20th July 1899, (CCR:v3) out of 'Acton Queen', bred and owned by Mrs. Illingworth. ACTON CZARINA,	Blue shorthair female, born 20th July, 1899, (CCR:v3) out of 'Acton Queen', bred and owned by Mrs. Illingworth. ACTON PRINCE,	Blue shorthair male, born 9th March 1899, (CCR:v5)(OC:17/Dec/04), out of 'Acton Queen', bred and originally owned by Mrs. Illingworth. Later sold to Mrs. E A Clarke and renamed 'PRINCE OF BATH'. AYTON BLUE STOCKING,	Blue shorthair female, born 25th April 1901,(NCC:v6), out of 'Ayton Blue Bell', bred and owned by Miss S.M. Butler. 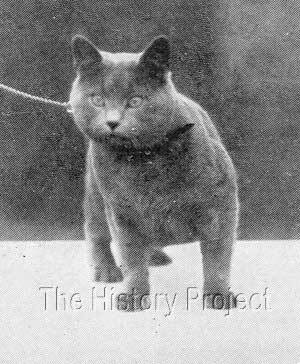 CATTERMOLE,	Blue shorthair male, born 25th March 1900, (OC:11/May/01), out of 'Acton Queen', bred and owned by Mrs. Illingsworth. 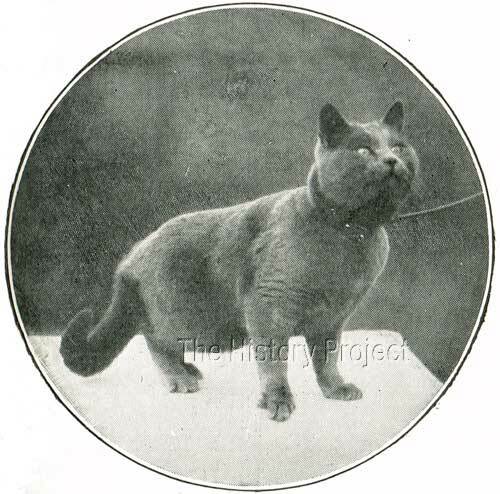 SHERDLEY NICHOLAS,	Blue shorthair male, born 30th April 1904, (MCCC:1904),by 'Sherdley St.Olaf', bred and owned by Mrs. Michael Hughes. SHERDLEY SACHA III,	Blue shorthair female, born 30th April 1904, (MCCC:1904) by 'Sherdley St. Olaf', bred and owned by Mrs. Michael Hughes. All of the progeny of record for 'Sherdley Michael' appear to come from two litters sired by him out of the same queen, 'Lady Henry'. These were born on 23rd October, 1902 and 20th April, 1903 respectively. Stud Advertisement for the 'Sherdley' cattery. Despite the fact that there was only one standard available to blue shorthairs in the late nineteenth and early twentieth century, regardless of having two distinctly different origins, and many exhibits having a mixed heritage containing both; the blue shorthair none-the-less remained a popular variety. Whether of the rounded, low set eared, heavier boned 'British' type; or the foreign, higher set eared, graceful lighter boned 'Russian' type, both varieties did ultimately survive this turbulent period of their history and in due course, both were granted separate standards and developed independently down a very divided 'conformation' path. Both are particularly loved for their amazing coat textures, which have also developed into very distinct and widely different types, so that there is no longer any muddying of the waters of recognition. British - Blue shorthair. Head: Round and flat, with good space between the ears, which are small and well set on. Shape: Cobby in build, round quarters, and good in bone substance. Coat: Short and close, of sound blue colour throughout; legs and feet shade lighter in colour, with no bars or markings. Eyes: Deep orange in colour. Russian - Blue. Head longer in formation, has space between the ears, and well-tapered face; fairly round under the cheek bone, thin, falls away under the eye, and comes out rather longer in back; less bone substance, colour same as the British shorthair, with no bars or markings; eyes deep orange colour. One of the truest signs of success in any breeding program, is consistency. The breeders who produce a consistent, clearly identifiable style and type, are those whose cats will be remembered, and those that will ultimately leave a permanent genetic stamp upon the breed itself. These are the breeders who 'raise the bar', drawing 'a line in the sand' so-to-speak, from which there is generally no backward developmental movement. The 'Sherdley' blues successfully marked out a strong baseline for type and quality, setting in motion a drive to maintain it that has never since abated. Our Cats Magazine, 20th December, 1902. Our Cats Magazine, 23rd June, 1900. Our Cats Magazine, 31st January, 1903. Our Cats Magazine, 28th November,1903. Our Cats Magazine, 17th December, 1904. Our Cats Magazine, 11th May, 1901. Photos and Quotations as per credits listed.